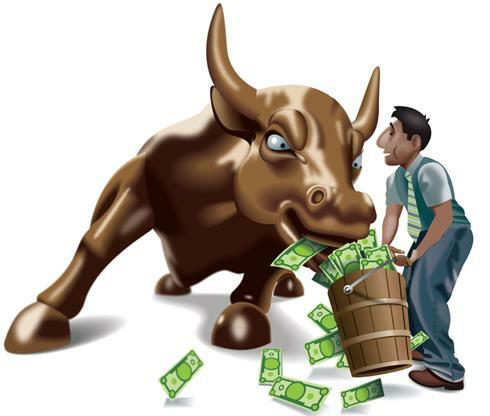 How long can a bull, fed on paper money, survive? It seems that a bull fed on paper money has eternal life. Whatever the news is, stock markets worldwide react positively. It takes a long time to kill off a secular bull even if it has the wrong diet. This last week stock markets surged on the news more QE is likely from the ECB and also from China. But the news from the Fed was again another U-turn with potential rate hike in December. As I have stated many times, neither the Fed nor any other central bank has got a clue what is happening. They continue to react to events and will change their mind on a daily basis. There is absolutely no central bank policy whatsoever. The Fed primarily follows the stock market. If the market is up they think that they can increase rates and if it is down, they will use whatever weapon they have available to stop the fall. So will they really increase rates in December? Well that depends on if the bull will get indigestion before then due to a stomach full of paper. In my view it is probable that the bull will die of exhaustion due to an unsuitable diet. We are likely to reach a point very soon when investors around the world realise that central banks printing trillions of worthless paper can never create wealth and therefore will just lead to a total implosion of the financial system as it gets multiple system failure. Looking at the bad news from all across the world, it is likely that this secular bull will turn down strongly before the end of 2015. Stocks are not up in real terms. They are only up because the world has increased total debt by 50% or around $70 trillion since 2007. In a normal world that magnitude of credit creation would have produced not just inflation but hyperinflation. But all this debt never reached real people. It was mainly used to prop up the financial system and thus continuing to fuel the speculative bonanza in all financial markets. The secular bull market in stocks topped around 2000. If we measure stock markets in real terms, they are all down substantially since 1999-2000. The Dow for example is down by 2/3 since 1999. And real terms means gold. Because gold is the only honest medium of exchange and the only money which has survived in the last 5,000 years. Gold is not an investment. No, all gold does is to represent stable purchasing power. A decent quality man’s suit 2,000 years ago cost one ounce of gold just like it does today. Throughout history, corrupt leaders and governments have consistently overpromised ? and under delivered leading to chronic deficits, money printing and mounting debts. This is why gold is continuously going up measured in paper money. And this is why gold will go to unimaginable heights in coming years as global debt increases exponentially. Just look at the US. There has not been a real budget surplus in the US since the early 1960s. A reserve currency cannot rest on a foundation of quicksand in the form of massive debt. This is why the dollar will soon continue its fall until it reaches its intrinsic value of ZERO as Voltaire said in 1729. All other currencies will also participate in this race to the bottom. But the dollar will soon take the lead. The unrelenting debasement of paper currencies will lead to continued gold appreciation. But it is not only the mismanagement of the world economy which will put upward pressure on gold. Physical demand for gold is extremely strong. For the first ten months of 2015, China has bought over 2,100 tons of gold. This points to a probable 2,500 tons of gold acquired by China for all of 2015. India is likely to buy around 1,000 tons this year. That makes a total of 3,500 tons for just these two countries and there are many other countries increasing their holdings also. Global gold mine production is 2,500 tons which means that just two countries are buying 1,000 tons more than annual production. 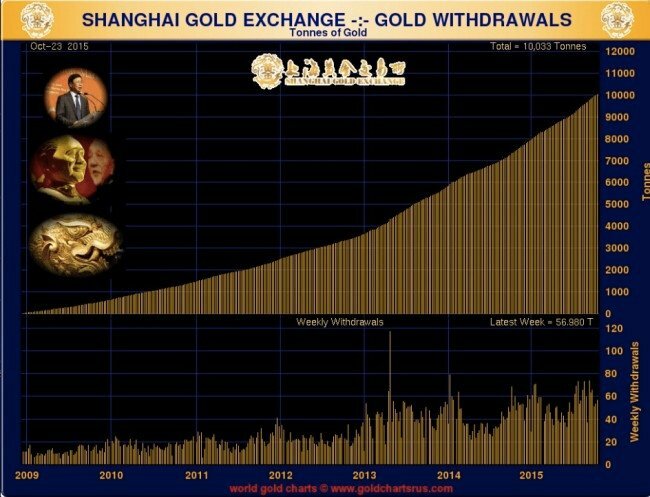 But with exponential money printing and stronger demand for gold than ever, why is gold not going up? Because in the modern corrupt financial world, real assets and real values don’t count. No, today it is all about paper assets and paper trading aka derivatives. Thus the gold price is not set based on the physical market. No, a manipulated and suppressed paper market is what determines the gold price. Big banks and central banks with the assistance of the BIS (Bank of International Settlements) are continuously suppressing the gold price in the paper market. This intervention is apparent for anyone to see since it often takes place even before the market opens or in a very thin market. No commercial seller would ever dump gold when there are no buyers. This ugly game is totally obvious and GATA has innumerable pieces of proof but so far to no avail. Central bank gold is covertly being leased or sold and the bullion bank stocks are decreasing rapidly. Nick Laird of Goldchartsrus has estimated that notional daily paper trading in gold is around 8,000 tons. Daily gold production including scrap gold is 10.5 tons. 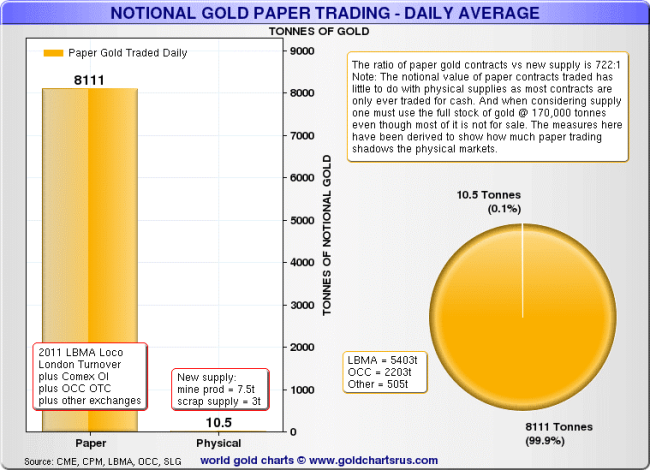 If Nick’s figure is correct the daily gold paper trading volume is almost 800 times the daily physical production. In the futures markets, including the Comex, there is maximum 1/100 of physical gold for every ounce of paper gold. In the bank market, paper contracts are issued with virtually no physical backing. The day that holders of paper gold realise that they will never get delivery of physical gold, the gold price will go up faster than anyone can imagine. And that day is probably not far away. Gold should not be bought for speculation or for a short term investment. Instead for the privileged few that have savings, gold should be bought as insurance against a rotten financial system and in order to preserve wealth. But remember it must be held in physical form and stored outside the banking system. When we advised investors in 2002 to put an important percentage of financial assets into gold at $300, our target was $10,000 in today’s money. We still stand by that target as a minimum. The problem for the world is that we are unlikely to have today’s money for very much longer. Because soon all central banks will print unlimited amounts of money to try save the world financial system from collapsing. But sadly solving a problem using the same method that caused it will not work and eventually we will see a deflationary implosion of the financial system. But before that we will have a brief period of hyperinflation that in nominal terms could take gold to $100,000 or $100 million. Tagged Bull Fed Paper Money.